Printable DASH tips! Announcing the Cryptotip.org Public Beta! Hey everyone, if you’ve been looking for the perfect cryptocurrency outreach tool, you’ve just found it! Printable DASH tips! (eventually we may add other cryptos to the site) We’re launching the public beta and this is the feedback and support thread for it. 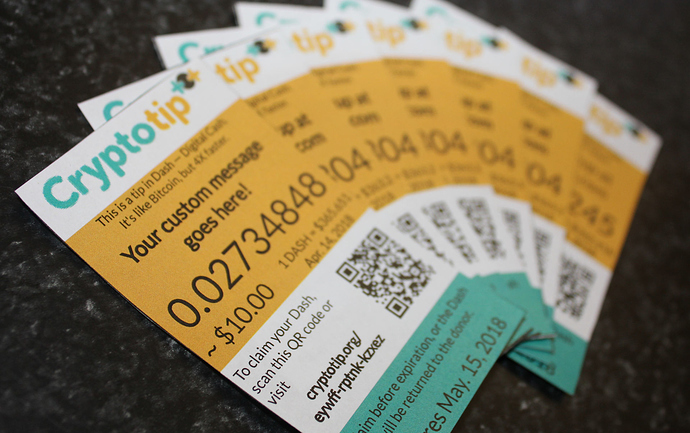 Just visit Cryptotip.org and you can order and print up as many tips as you like, in the dollar amount you choose. They are business card sized with unique URL QR codes that will give the recipient instructions on the basics, like setting up a wallet and then will allow them to release the DASH you’ve allocated to them, directly into their wallet! Plus, they are trackable. Once you get your tips, you can visit your page on the site to enter helpful notes about each tip you leave. So, you could jot down the name of the server and restaurant you were at, for instance. Then, if the server redeems the tip, you’ll get an email alert letting you know! Also, if they DON’T redeem the tip, they expire and you get the DASH back in the wallet you specified when you created the tips, and you choose the expiration date! These things are great - I hope you find them as useful as we do. They were originally inspired by bctip.org, which did this with BTC, but the fees just got too insane last year, so after I asked bctip if they’d add other cryptos and he said no, I brought in @error to program an altcoin version and we chose DASH as the first crypto on the site. Feel free to leave any comments, critique, suggestions, or tech support requests here. Helpful suggestion: Always leave a good cash tip PLUS the cryptotip. If you don’t, you’re guaranteeing the server won’t look at your cryptotip. I’m still tracking down an intermittent issue where, after placing an order and sending the DASH payment, the page does not update to reflect the received payment. If you see this happen, reload the page in your browser, and you should see the updated payment status. P.S. If you like the cryptotips, please leave a tip for the site when you create your tips - 100% of it goes to @error for his continued support and fine programming work. This is really cool and I hope it takes off in usage, but I want to mention that people shouldn’t be mad if your server doesnt want to be tipped this way. Due to tip sharing and handling payroll getting small amounts (or even any amount) of crypto as a tip might not always work out in their best interest. I say still go for it of course, just be aware. I could see a scenario in which I leave a FRN$10 tip but once the person redeems it, they only get $6 due to market fluctuations. One interesting feature might be if the units didn’t have DASH amounts but rather just FRN values, and when they redeem they get the appropriate amount of DASH. The tips have both pieces of data, @Patrick. They show the amount in DASH and what that was worth in USD at the time of its purchase. I see that in the photo and will try it out. I was thinking if the DASH is in a custodial account, or escrow, that the DASH amount could be left off. SO the paper would only say $10 USD and whenever they redeem it they get $10 worth, regardless of fluctuation (to avoid a scenario where they get $5, a lower tip than intended, down side of avoiding a tip of $20, which would be a welcome suprise). The system could be restructured in the way you describe, but it would be a major restructuring and would also present a major problem, which is that if the price of DASH drops significantly over the time period you’ve set for expiration, your account may no longer have enough DASH in it to cover the amount you originally selected, which would still either result in the person not getting the full amount of DASH, or getting an error. Would recommend setting a shorter expiration time if you’re concerned about the price changing. Very nice. I have a technical question. How is the expiration of the tip implemented? Does this use Hash Time-locks? I know I am bringing back a old thread but since the last question was not answered (at least not here) I thought I’d take a shot at an answer. Short answer - I don’t think that Hash time locks are used. I think that this service is holding the coins in a custodial wallet and then explicitly periodically checking for expiration and sending the coins to the appropriate address. if cryptotip service goes away, then people won’t be able to retrieve the tips you’ve left and the coins won’t be returned. I am basing this on looking at the source for the original bctip (which is easy to find since it is linked to clearly from that site). Since cryptotip does not explicitly point to a source code repo like bctip does, I can’t be certain but looking at the URLs and a test transaction and the bctip source, that would be my guess. Note this does not mean that I would not recommend cryptotip - I’ll probably use it for an activism project I am about to do - but it does mean that I’d limit how many tips I’d fund at any one time. In fact, I’d encourage people to use the site and donate as you do to keep the project financially viable. I’d also add that I don’t think hash time locks can quite work in a manner that would support the cryptotip usage model in any useful manner (at least on the bitcoin network). I can’t know in advance what address will claim the tip, so a hash time lock contract won’t work. At least not any way that I have been able to figure out. I’m open to suggestions though. It is indeed a custodial wallet (or rather, one for each crypto). So it’s my reputation on the line. I’m not very happy about holding other people’s money, so I at least try to be as cautious with it as I can. That includes running my own full node builds with SELinux, not using Ubuntu, etc. Thanks @Jeff_NH and @error . Thanks - and to be clear I was not implying anything nefarious with the custodial wallet statement - just trying to make sure people understand the risks and benefits. As I said, understanding those risks I still moved forward using cryptotip on a recent project and it worked great.